A quick entry for remains of a bouncy platformer game in very early stages and written by Cory Kin. 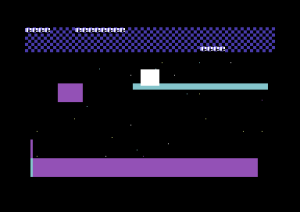 There was no name attached to the game, but upon executing we have a sprite which drops down from the top of the screen and seems to be able to scroll left and right and bounce from platform to platform. Certain platforms flash and can kill you if you land on them. It seems there are no level maps intact, and it just happened that some character in memory helped to populate the level. We are hoping that Cory will recall something about the game. We did wonder if this was actually Pet Rescue in an early form, but trying to embed some of the graphics that we found didn’t quite fit, so we believe it is something else. Feel free to check it out for now!